Rob is a local guitar instructor with over ten years experience who performs, writes and records with several of the community's top musicians. Rob studied music at Franklin Pierce College in New Hampshire and teaches all styles of guitar in his home of Fairfield Ct. 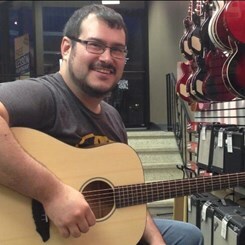 Rob is also proficient on bass, ukulele, mandolin, and banjo. Fond of all genres of music you might find Mr. Maresca playing funk, rock, reggae, and blues with fantastic bands at your local clubs or performing solo guitar for a private party or wedding. For as long as Rob's been performing and educating, he has been listening and learning with an open mind. Whether it is been writing with a band shedding tunes or showing students the true amazement of the guitar, Rob's love for music and skill on the instrument is both encompassing and encouraging and above all entertaining. It's no surprise that Rob's second love is comic books, as he truly knows how to create an exciting story on any guitar he picks up. It is easy to say his chops are heroic and is earning his right to be a hero of the guitar. Request Lessons with Robert Maresca today!